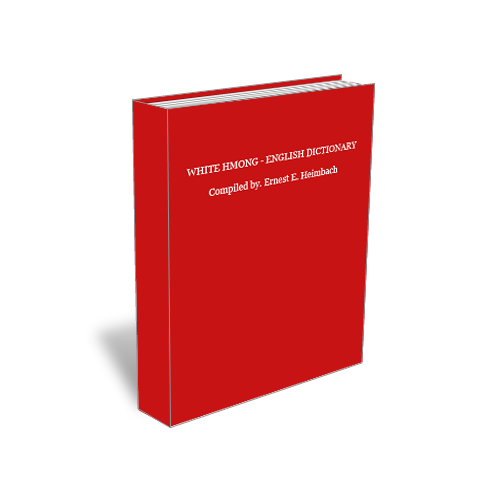 Ernest E. White Hmong Dictionary This is a free PDF dictionary. It covers many of the older Hmong words, often what you would find in the Bible. It is considered by some to be the best available dictionary in the Hmong Language. And best of all, it’s free! It is suggested that you right click on the link and click Save As… to save the dictionary to your computer. E.E. H. White Hmong Dictionary (Slimmed Down Version) This is the above dictionary, re-typed to be a cleaner, smaller file size. It has all of the letters bookmarked and is only about one megabyte. Great for searching on Tablets and Smart Phones. It does not have the introduction or appendixes. Travis, This was a labor of love on your part to retype this version in nicer font and to bookmark it. Thank you so much! Even though it is written in the Hmong-English format, on a tablet I am able to use the search feature in order to get the English-Hmong equivalent. It is a pleasure to help. We are always trying our hardest to provide more useful items to help the friends.